We keep getting Treasure Keys for Cindy events, and that's awesome! The biggest donations came from Reny (200 Treasure Key) and Maysys (100 Treasure Key). Thank you very much. Keep in mind, that if you need a dementia potion to refocus at Luca, you can request one for free. 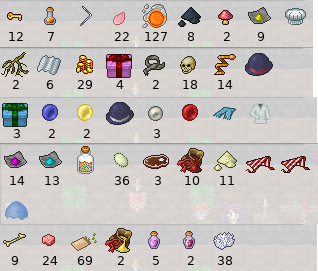 2 Forest Armors, 2 Forest Bows, Fairy Hat, Jeans Chaps, Fur Boots, Cotton Boots, Boots, Red Cotton Shorts, Red Shirt, Black Turtleneck Sweater, Miners Gloves, Candle Helmet, Rock Knife, Bone Knife, 323 Iron Arrows, 16 Lifestones, 38 Cobalt Herbs, 34 Alizarin Herbs, 20 Gamboge Herbs, 7 Cocoons, Red Rose, White Cake, Cherry Cake, 2 Logs, 3 Hard Spikes, 4 White Furs, Coal, 7 Iron Ore, 2 Iron Potions, 113 Red Apples, 146 Maggot Slimes, and 93 Book Pages. Thank you for that. Those items will be used in the upcoming Terogan & Razha events. A very big "Thank You" is extended to Officer Reny for his exceedingly generous donation of 1,000,000 gp. Many thanks to Rikki for his welcome donation of 150 Treasure Keys. To the anonymous donor who contributed the beautiful and rare Red Rabbit Ears, thank you very kindly! Per Tsukoshi's request, the first two items (Lazurite Robe and Jar of Blood) will be awarded as prizes in a future CRC event. Thank you, Cap'n Trav, for the much-appreciated Red Wizard Hat!